So how exactly do you put sheets on a triangular bed? I looked online to see what other people did to try and come up with the best solution. 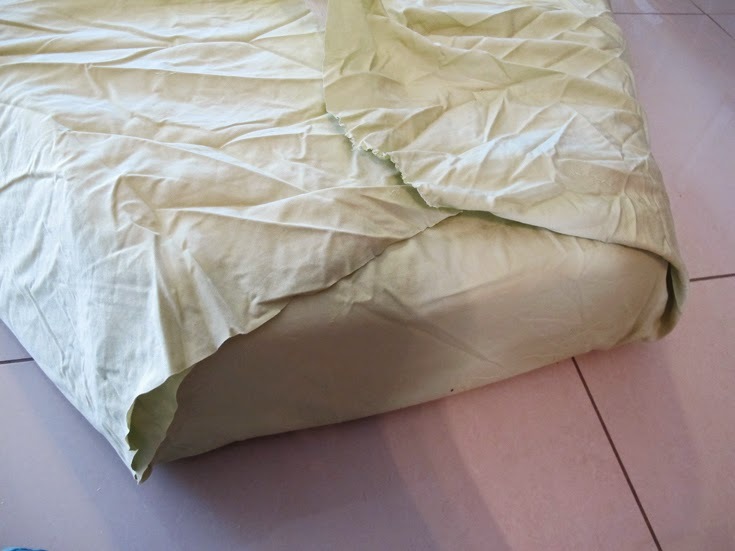 Some people buy custom made v-berth sheets online which are hundreds of dollars and others just use a regular sheet set and tuck the excess material under the foot of the mattress. I decided to combine the two ideas by making custom sheets myself out of a regular set. Now I'm not the best seamstress and they aren't as nice as the ones you can order, but they are way way cheaper and work great! I ordered 2 sheets of king sized sheets online and gave it a go! 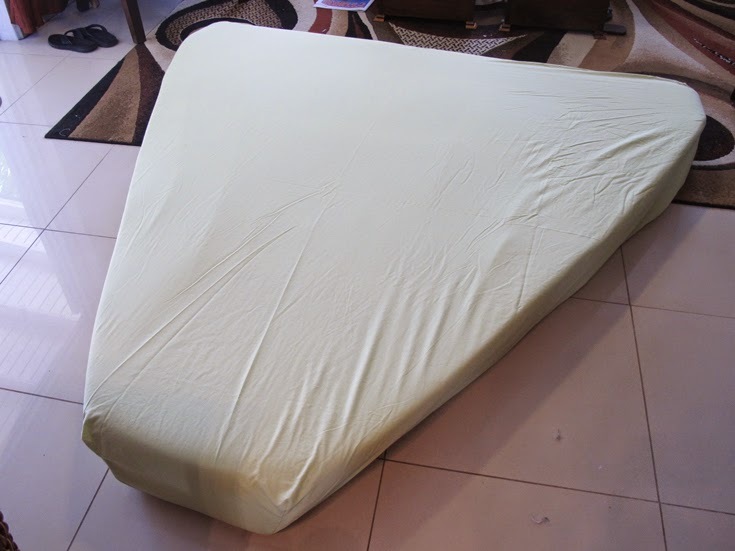 A friend of ours orders microfiber sheets from Wal-Mart (I know, I hate them too, but these are great sheets) and they are so comfy, very lightweight, dry in just a few minutes on the line, and are only $20. Check them out here if you're interested. The flat sheet is easy. 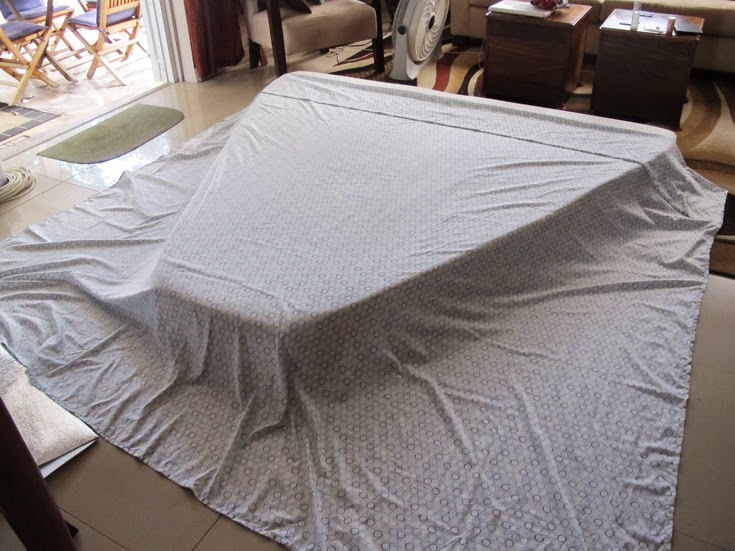 I just draped the sheet over the mattress and the got under it and rolled around a bit to see how much sheet we really needed (this is a very technical approach obviously). I decided to leave about 12" on either side and then cut the sheet to the shape of the mattress and hemmed it all around. Done! Now there's not a ton of fabric to get all tangled up by your feet! The fitted sheet takes a bit more work. The sheet fits perfectly on the top corners of our mattress so all I had to do was make the bottom fit. I decided that I would fold up the bottom to make it like a pocket that fits around the bottom of the mattress. That way you can just slide the pocket over the mattress when you make the bed and it stays put. I put the sheet on inside-out so after I trimmed the sheet to size, I could pin it all up for sewing. Here's the bottom sewn up. 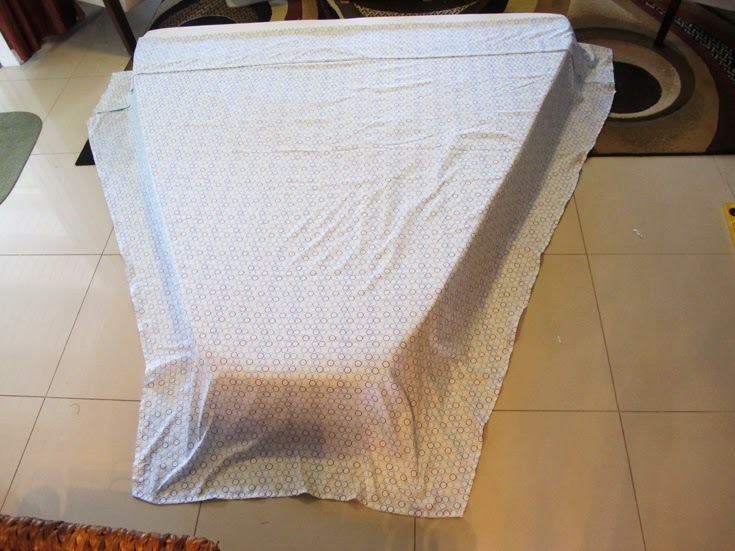 I pictured the sheet like an envelope and you can see that's exactly how I sewed it together. It's easier for me if I have a visual in mind - maybe that'll help you too. From this point, I sewed the middle together up aways to make the pocket deeper and to make everything fit as nice as I could. And here's the finished product - not too bad for the first set! The second set I made turned out better, but I didn't get any pictures. I absolutely love this blog! Please keep updates coming! My boyfriend spontaneously bought a sailboat this summer that is in need of some loving care, and your blog is so inspiring. We are off working for 6 months so our boat is currently on the hard, but we'll keep adding posts when we return in April. Love how you adjusted the sheet for the V end of the mattress. 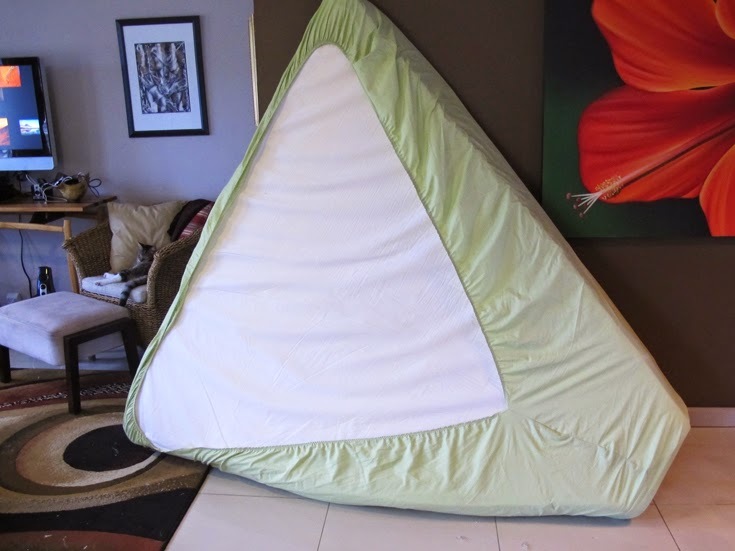 I've been sleeping in and making a V berth for about three years now, I wish i'd seen this blog sooner. The weekly struggle of trying to make a bed with ill fitting sheets is real and very frustrating. I've always toyed with idea of making my own sheets but had no idea how to go about it. Thanks for sharing your awesome efforts! Great idea! Our berth is not a triangle - kind of a weird shape that I havent been able to figure out how to customize. Maybe this will help... Thanks! Brilliant, I can't wait to try this!! 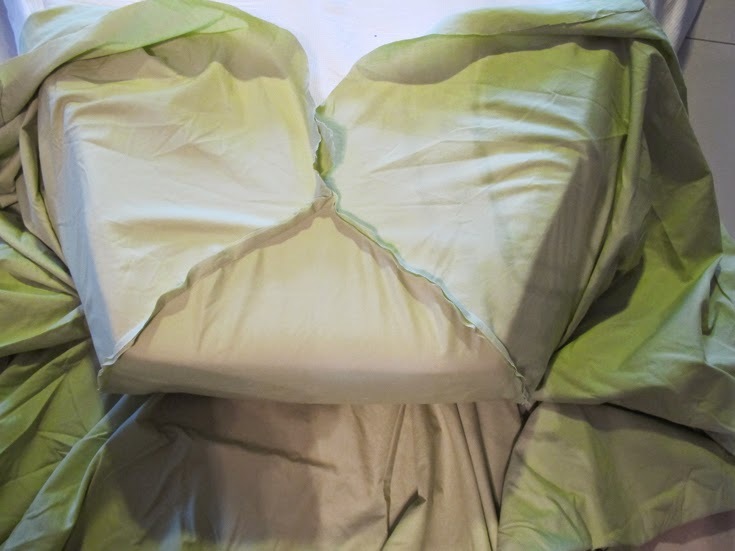 We also want to replace our cushions, do you have any tips on making a custom mattress? Or where to get an affordable be berth mattress? I'm thinking about getting a nice piece of foam and cutting the corners off. Thank you! My boyfriend and I went through your whole blog, it's fantastic. We're wrapping up renovations on a 1964 Columbia 26. That electric bread knife is the best idea!!! I can't wait to try it and the cream of tartar! Thank you so much for sharing all your hard work! And we just got some fabric to make the fitted cushion covers that you did too! Such an amazing solution! Hip hop hooray to you both!! Awesome! So glad our tips were helpful to you guys! The electric knife works so good, like cutting butter. I hope the cushion covers turned out good. What a difference a little fabric makes, huh?!! 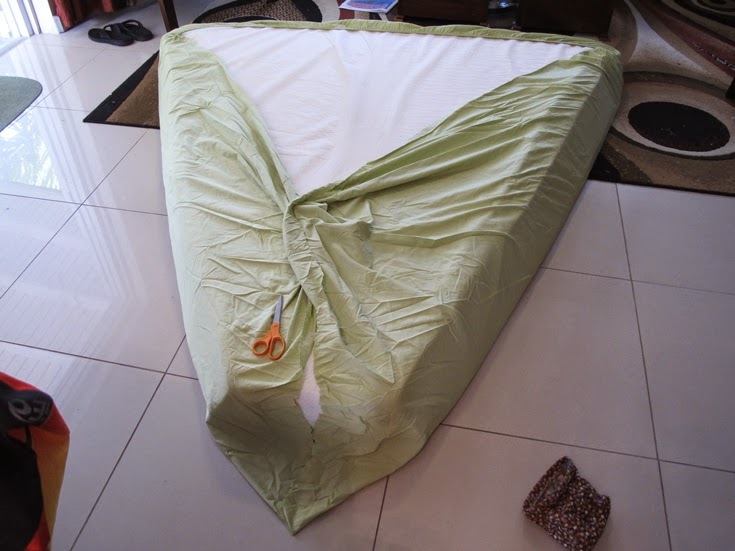 Our daughter just took delivery of a brand new sailboat and has asked me to make her fitted sheets for the mattress'. Your instructions make it doable! Thanks. Perfect! Hope it went well! I'll be trying this! Thanks for sharing. Your blog is very nice.I read these article types and property in detail.this is one of the posts in your blog. so let's talk curtains? Did you make any... please tell. The texture of the sheet is paramount to a restful sleep and high thread count bed sheets will provide the texture needed to achieve this goal. silk bed sheets Another rule is that you should select sheets as per your bed size.